Built in 1805 “The White Church” is a Grade A listed building lying at the heart of the historic conservation village of Comrie. In 1965 the Church of Scotland General Trustees handed over the building to local trustees to serve the village as a community centre. In 2000 the centre underwent a major refurbishment with funding from the Millennium Commission, many other funders and an enormous funding raising effort on behalf of Comrie residents. It now provides facilities for youth and community groups and hosts a plethora of events. Comrie Community Centre from Dalginross Bridge Built in 1805 “The White Church” is a Grade A listed building lying at the heart of the historic conservation village of Comrie. In 1965 the Church of Scotland General Trustees handed over the building to local trustees to serve the village as a community centre. In 2000 the centre underwent a major refurbishment with funding from the Millennium Commission, many other funders and an enormous funding raising effort on behalf of Comrie residents. It now provides facilities for youth and community groups and hosts a plethora of events. The White Church is the central feature of what is undeniably an exceptional, lively community. There are in excess of 50 community groups within the village of approximately 2,000 people. Most of these groups use the centre for regular activities, fundraising or social functions. The centre has three different sized halls to cater for every event. There is also a fully equipped kitchen.There is access and facilities on both levels of the centre for disabled users. As well as a lift to give easy access to the first floor, there is also a large toilet facility complete with a shower unit. 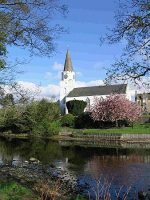 If you would like to view the facilities or talk about what the centre can provide and fees involved, please do not hesitate to contact Fiona Stewart – Administrator, Comrie Community Council, The White Church, Dunira Street, Comrie Perthshire PH6 2L.